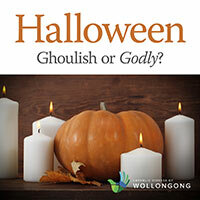 Halloween – Ghoulish or Godly? Halloween is growing in popularity but its roots are lost on most people. It is observed on 31 October, the “een” or “eve” of All Hallows Day (All Saints Day) on 1 November. “Hallow” occurs in the Lord’s Prayer – “hallowed be thy name” (may God’s name be held holy) – so to celebrate Halloween without connecting it to All Saints Day would be like celebrating Christmas Eve without a Christmas Day. If you take away the Saints from Halloween, along with our Christian beliefs about the dignity and destiny of human beings, then all you have left is a pre-Christian Celtic celebration held at the end of summer in the northern hemisphere. As days shorten and winter nights lengthen, the spirits (goblins and ghouls) have more dark time to be mischievous and haunt. The pagans appeased them with treats so as not to suffer their tricks. The “trick or treat” tradition comes from people disguising themselves as evil spirits, both to fool them into leaving them alone, as well as to steal the treats left by people to appease the evil spirits. When Christianity came to Ireland, they wisely baptised “Halloween,” sifting out what was true and disposing of the superstitious. We Christians believe in a spirit world of angels and saints. In time there developed (it seems in Ireland) a feast of the spirits who intercede for us, not frighten us. This became the celebration of All Saints at the end of the northern summer and some time later evolved All Souls Day to pray for the spirits on the way to God but who needed help. All this reminds us, despite our modern day individualism, of the unbelievable connections we have in the family of God – on earth, in purgatory and in heaven. So these days of Halloween, All Hallows (All Saints), All Souls celebrate what we believe and name the “Communion of Saints.” Fr William Bausch says dressing up for Halloween ritually connects us and symbolically joins us to the community of the invisible world. He says that the scary masks (witches, skeletons, etc) from a Christian point of view, are a symbol of human disfigurement brought on by sin, betrayal, sickness and death. But faith reminds us that eventually those masks, by the grace of God and our faith, will be removed and we shall be made beautiful as ugliness dissolves, sin is cleansed and even the last enemy, death, falls before the everlasting mercy of Christ. Jack-o-the Lanterns, roaming forever between heaven and earth, holding his pumpkin lantern high, is a one-man morality tale associated with Halloween. Jack is smart enough to outwit the devil himself, but it is not enough to get him into heaven. Jack was so self-centred that he never helped another human being. He used his giftedness only for himself. While Jack knew about faith and the power of the Cross, he failed to take up his cross and follow Jesus. Fr Bill points to the irony of our modern world which really discounts faith, the interior life and organised religion, yet plays this cultural game of secular Halloween. But the spiritual, in fact, sneaks in, as secular people flirt on Halloween with the possibilities of another world and, as Fr Bill puts it, Halloween “scratches a growing spiritual itch without losing face.” He says it shows that our very one-dimensional secular world still needs fulfilment and peace – something deeper. First, before going out “trick or treating,” why not gather the family to offer a prayer for deceased members and friends, people of our past who meant something to us and whose influence is still with us. Second, bring out the family album for the triduum of Halloween, All Saints, and All Souls; put it on the coffee table with a little lit candle in front of it. This makes a statement to your children or grandchildren that we all come from a long line of people who loved us and that Halloween is sacred time as well as fun time, that we are part of their journey as they are of ours. Third, on All Saints Day, possibly around the dinner table, have family members research the saint after whom they are named and tell everyone something about him or her. Finally, you might bring some of the things you may get by going around tricking or treating to a nursing home or send to the St Vincent de Paul Society. Halloween, All Saints, All Souls: is especially a time of faith but can also have a touch of “trick or treat” fun! [Fr William Bausch “Once Upon a Gospel” Pp 572-574.] Halloween also invites us to talk openly about death which is a taboo topic for so many, almost as if it were not a real fact of life! You and I need to press the “pause” button in our crowded lives to reflect on our own mortality, with all the spiritual and practical consequences that go with it. Fortunately each year the Church gives us two feasts, All Hallows (Saints) and All Souls (the Commemoration of all the Faithful who are departed) to do this. This entry was posted in Bishops and tagged All Saints Day, All Souls Day, Halloween on October 31, 2016 by ACBC Communications.